Nothing original, but a few links. More WPC reports: world champion Ken Endo’s report, and a behind-the-scenes look by one of the authors, Andrey Bogdanov. My Different Star Battle on croco-puzzle is now publicly solvable. I’m really rather pleased with how that one came out. 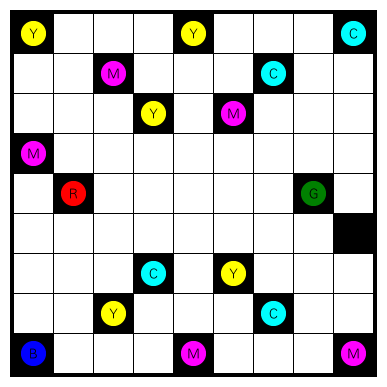 I posted a somewhat different puzzle, based on the game Tic-Tac-Toe, to the puzzle portal: Tic-tac-toe reconstruction. (Click the UK flag for English instructions.) Some of you might enjoy that. This entry was posted in Puzzles and tagged links on 2015-11-15 by rob. Here’s another WPC practice puzzle, a Magic Summer from the round of puzzles with different areas, just like the recent Different Tapa. While on the topic of WPC puzzles: There’s a WPC series starting today on croco-puzzle. It’s authored by Silke and me, with a selection of puzzle types from Sofia. These are all “Ü2”, so you can solve them with no Java applet worries. Rules Place digits in some cells, so that each row and column contains exactly digits 1 through 5. In addition, the gray cells must all have different content. This entry was posted in Puzzles and tagged different, magic summer, medium, variant on 2015-11-05 by rob. 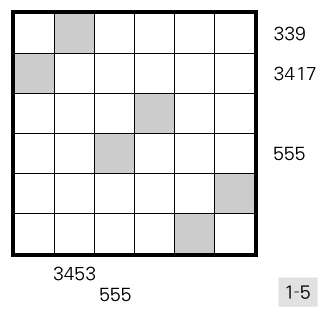 Here’s a practice puzzle that I made for the color-themed team round at the WPC. Some of the intended logic may have been lost in getting it correct, but enjoy nonetheless. Rules Place some red, green and blue light bulbs. These shine in vertical and horizontal direction until they hit a black cell. Every white cell must be illuminated, and no two bulbs may illuminate each other. Colored clues indicate the composite color of the bulbs that illuminate it: pure red, green or blue, cyan (green+blue), magenta (red+blue) or yellow (red+green). Or see the WPC instructions. This entry was posted in Puzzles and tagged akari, color-akari, medium, variant on 2015-11-01 by rob.